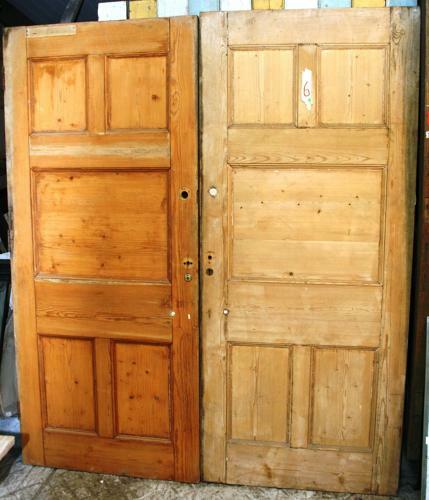 Dating to c.1910 this is a pair of solid pine, Arts & Crafts doors. They are stripped but need sanding prior to painting or polishing. Fully morticed and tenoned, the doors are suitable for internal or external use. Please note we can quote to convert upper panels to glass if required. We currently have a similar pair of doors, see DP0238. These doors were originally 2 matching single doors which we have paired. We can set up the doors with rebates where they meet, if needed. The doors could also be stripped to match colour. Please contact us for a quote.